Are the bubbles on the bubble wrap not enough? Are you craving for even more bubble popping action? Why, you can sign up for Bubble Witch Saga 2 for all your bubble popping needs! 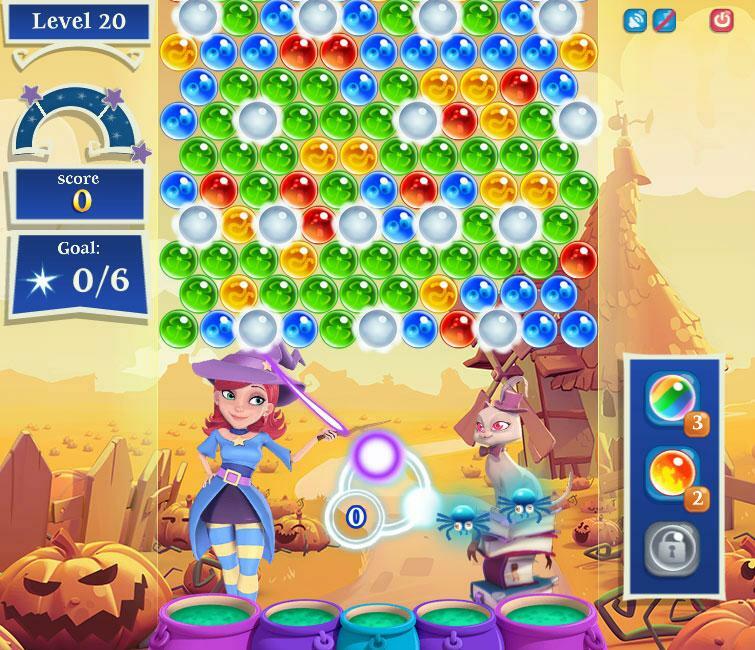 Match 3 or more bubbles of the same colors in this game and let the bubbles rain down into the cauldrons below! Complete challenging goals, with or without boosters, to proceed to the next stage! You’ll even get the hot pot combo with every consecutive good shot you made. Don’t forget to rack up those high scores so you can brag to your friends! 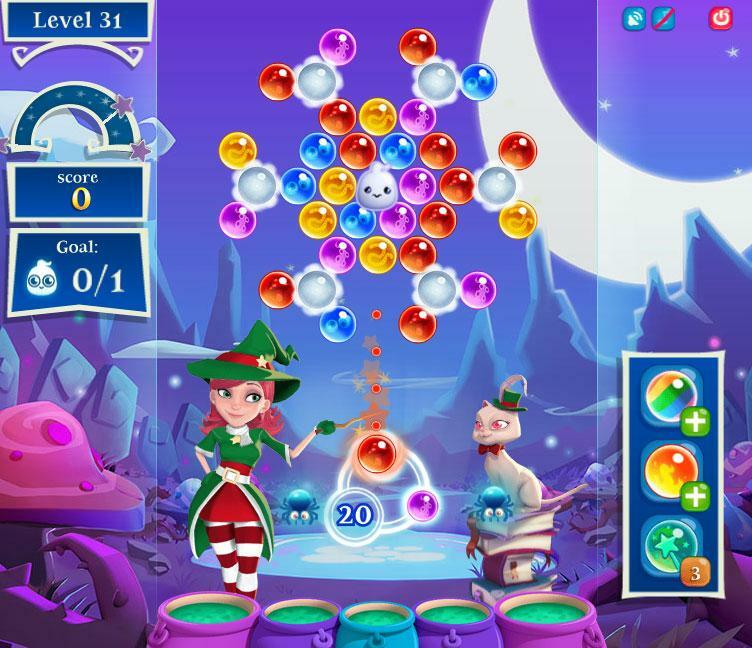 Bubble Witch Saga 2 is one of the top free-to-play bubble shooting game and you’ll be missing out if you don’t at least give it a go! Try it today! 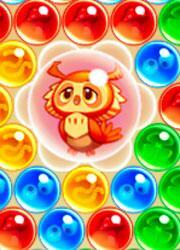 In this game, you will need to match up 3 or more bubbles of the same colors in order to pop them. The earlier levels are pretty straightforward and easy, but as you progress, you’ll learn the importance of being able to pull off trickier shots. By bouncing your bubbles against the walls, you can hit the sides of the bubble formation, making it much easier to bring down whole chunks of bubbles without the hassle of plowing through the bubbles in front! However, tricky shots can be really tough to perform unless you have a certain booster to help you out with the aiming. If you don’t mind the advice, well, you could just place a ruler at the part where the aiming line bent off on the screen… it works, most of the time. Furthermore, if the bubble in your cannon is not the color you need, you can change it for the next bubble by clicking on your bubble shooter. 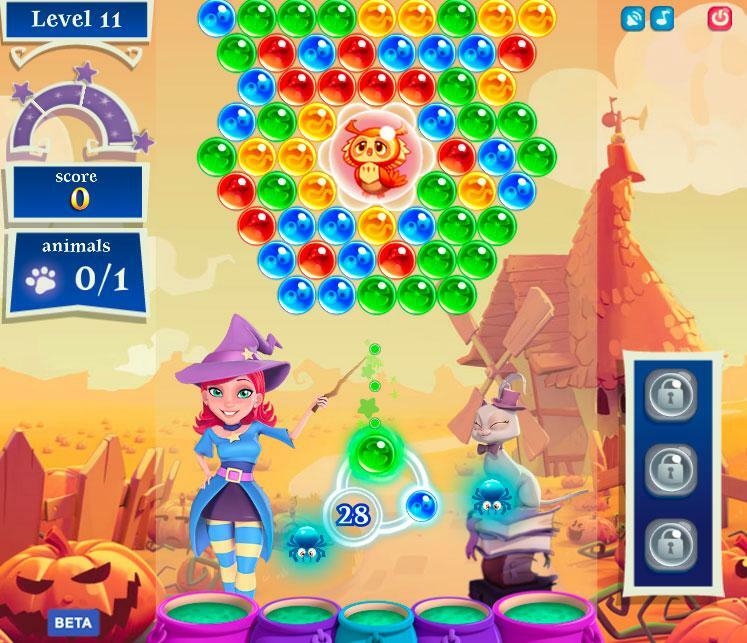 Unlike the famous Zuma, Bubble Witch Saga 2 offers something different than just being a‘bubble/orb shooter’. It has goals and some very challenging boards. There are generally 3 major goals, one of which include the most basic goal of all – clearing the bubbles at the very top to uncover the required number of stars. The second goal involve saving a ghost – don’t worry! It’s a friendly ghost, like Casper. The poor ghost was somehow trapped by bubbles and your job is to burst the bubbles around it to set it free! Last but not least, there are also ‘save the animals’ level as well. A number of miniature animals are trapped inside the uncolored bubbles and you’ll need to help them escape by dropping the bubbles. There are several other varieties of goals, but the above 3 are the most common that you’ll be facing in this game! As you progress, you will also encounter special bubbles on the board like clouded bubbles that you will have to hit with another bubble in order to reveal its color. If you managed to score good shots in Bubble Witch Saga 2, you will be able to summon spiders that dangle by their silk thread from the top to boost your score. Whenever you finish a level with any leftover bubbles both on the board and in your shooter, the extra bubbles will be rained down on the spiders. Every spider hit will earn you bonus points. It feels like a pinball game without the pins at this point. Not only that, after the bubbles have gone through the spiders, if there are any, they will fall into the cauldrons at the very bottom of the screen. 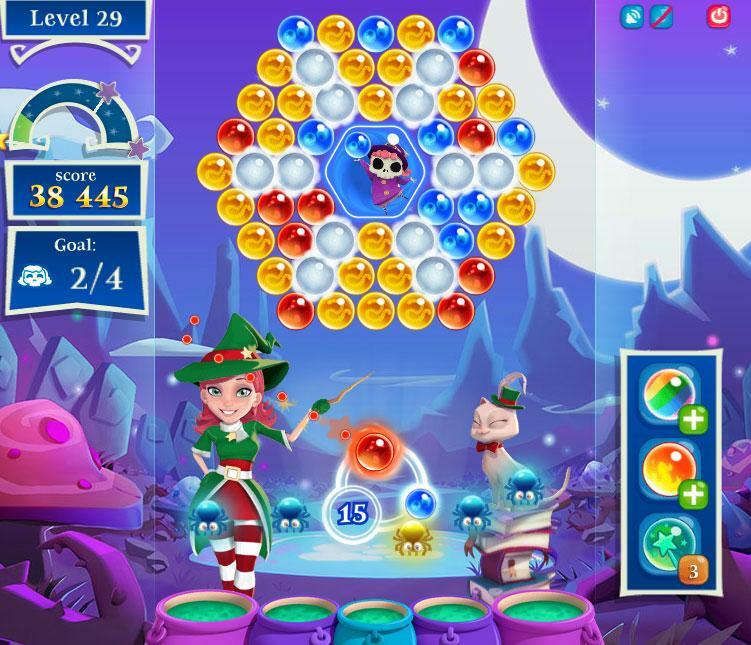 The cauldron in the middle has the highest score (1000 points) while the cauldrons that are close to the side are only a 100 points each, so you’d want to keep your bubbles going into the middle. Moreover, if you can perform multiple consecutive good shots, you will trigger a special combo event called ‘hot pot’. Under the event, every good shot you do will keep the event from expiring and will also earn you double points. Awesome, right? Everyone’s not perfect and there will be times when you failed a level. A failure will cost you 1 life out of the 5 lives maximum that you can have. Ran out of lives? Don’t worry! These lives will regenerate over time and if you’re eager to continue, you could always buy more lives with real money. Failed a level repeatedly? Now, that’s very disheartening, isn’t it? 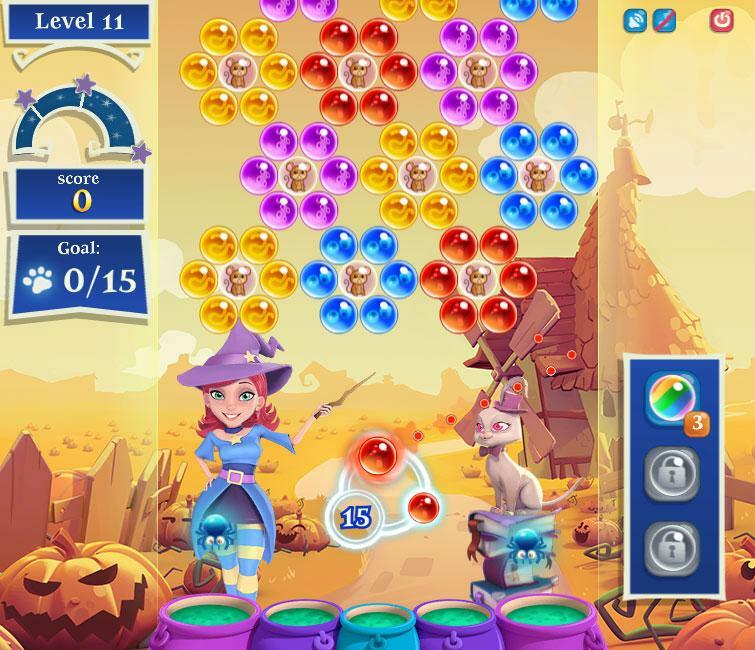 Bubble Witch Saga 2 provides plenty of boosters to help you out from these very tough spots. Boosters, such as rainbow bubble will be able to remove any group of bubbles of the same color, while lava bubble will help you to burn away 3 bubbles of any type. There are also fairy potions that will summon a fairy who will create helper bubbles every time she appears. Fireballs are particularly useful too in this game – they can burn through everything in its path, allowing you access to the bubbles buried within a complicated bubble formation. Some of these boosters are available before entering a game, such as fairy potion or lava bubble, while some are only available when you’re in the game, like rainbow bubble or fireball. You can also compete with your friends by comparing your scores. If you happen to have the highest score among them all, feel free to share your moment/s of triumph on your timeline to rub salt into their wounds. Hey, you deserve to brag after all! There are over 8 million likes on its Facebook page. That’s not counting the ratings it gets in the android or iOS markets. 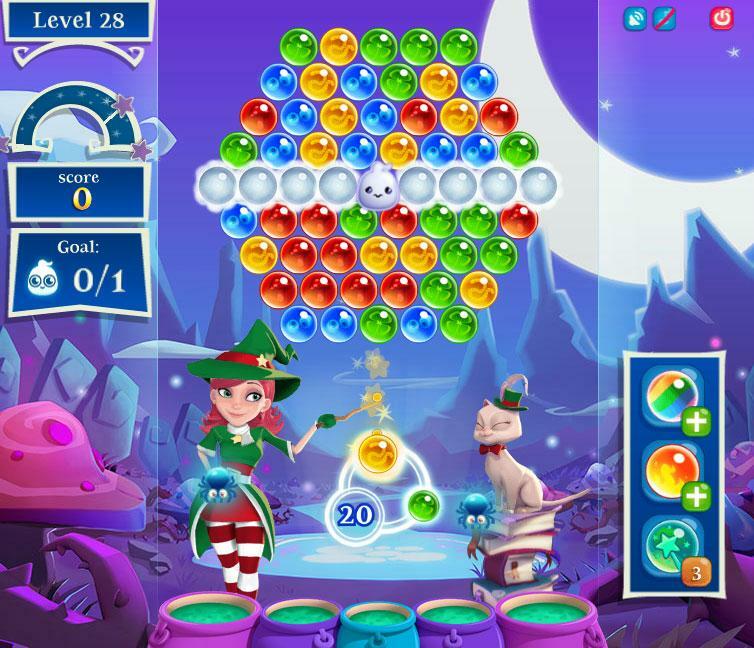 Needless to say, Bubble Witch Saga 2 is indeed one of the most popular bubble shooter/puzzle games on the internet! Anyway, if you need a group of dedicated players who gift each other lives, the Facebook fan page is the place to be! Furthermore, the site also posts walkthrough videos to help you to complete some of the much tougher levels and sometimes, it organizes booster giveaways. So, be sure to head over there and like the page to be a part of the lively community! 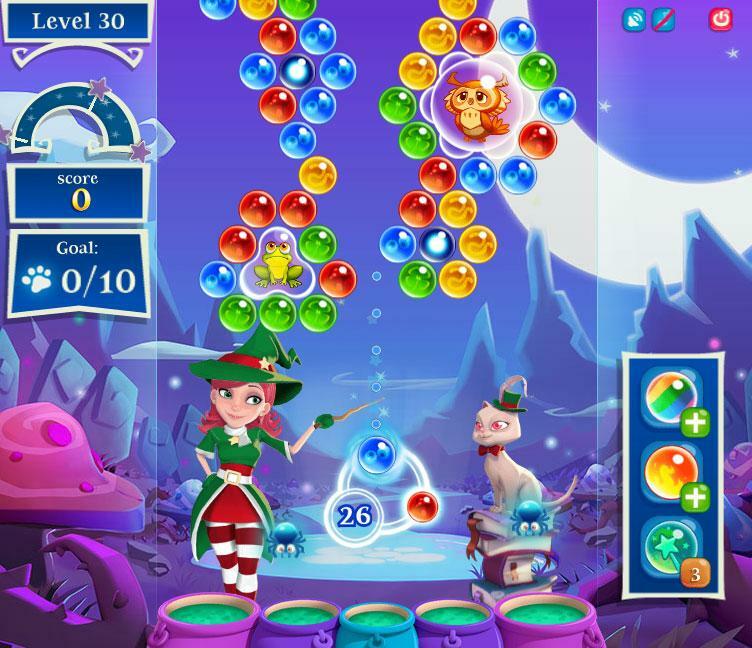 The brightly-colored graphics in Bubble Witch Saga 2 is extremely attractive and exudes a feeling of fun and excitement! The seemingly hand-drawn art in the game are very well-done. The graphics helped to create a magical atmosphere in the game! The sound in this game mainly consists of instrumentals and is placed in a loop. The quirky music is perfectly suited to the ‘witchy’ theme this game has. It is pleasant to hear and it brings a certain level of immersion into the fantastical world of magic as you play! 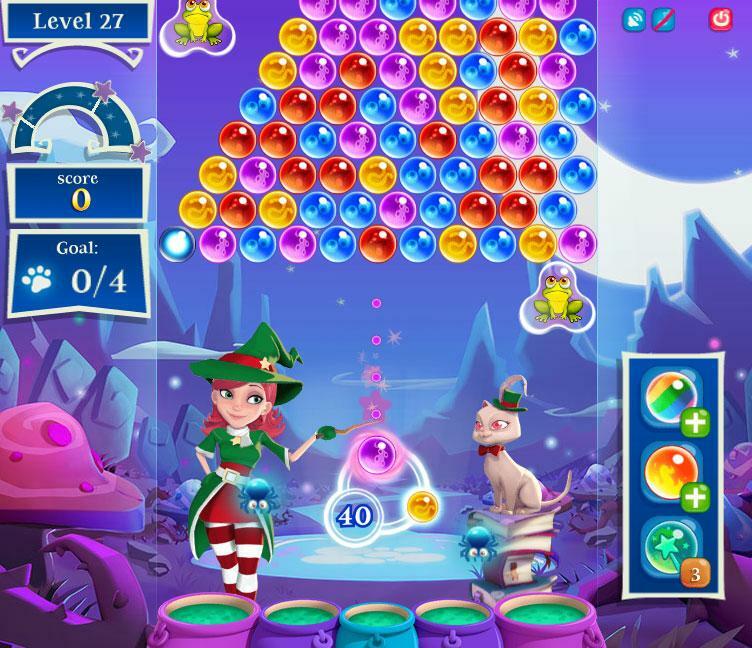 Bubble Witch Saga 2 is a very addictive and exciting bubble shooter/puzzle game whereby you have to match bubbles up in order to pop them. It offers levels after levels of brain-teasing games that will require you to have excellent bubble-bouncing skills, a good eye and very good aim. If any of the more difficult levels got you stumped, you could also use boosters to help you out! If you’ve played the first version of the game and loved it, you will love this game too! 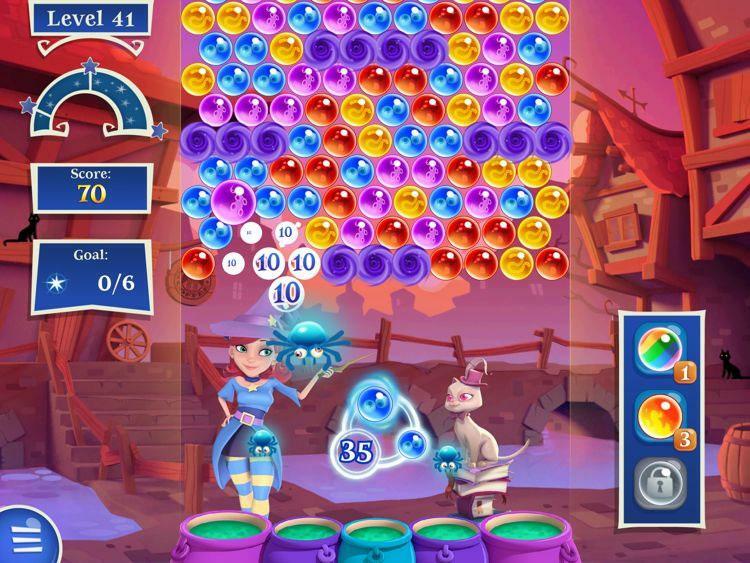 So, jump right into Bubble Witch Saga 2 and experience a magical adventure with Stella the witch today! by Aethyna Jan 1, 2015 Follow the Good Witch stop the Nasty Morgana from destroying Witch Country in a really cute Bubble Shooter game. Enjoy a truly unique experience that looks great and is fun to play. Read More Be the First to Post a Review!